An art degree isn’t a dead end. Here’s how to find work and fulfillment in a nontraditional field. Many people think that finding work with an arts degree is tough, but research suggests that perception is false. The Strategic National Arts Alumni Project tracks the career paths of arts graduates nationally. According to SNAAP research director Steven J. Tepper, employment rates and the time it takes to find employment are actually similar for art grads and grads with other degrees. What arts grads are less likely to have is a full-time job. Artists in fields like design and digital media are more likely to have employers, though those fields also have many freelance workers. But in other artistic fields, project work is far more common. According to SNAAP research, nearly 60 percent of arts graduates hold at least two jobs concurrently. They are also more likely to work in a variety of different roles such as teaching and community engagement in addition to creating art. • Expand occupational imagination. The more than 110,000 nonprofit arts organizations in the U.S. offer a variety of opportunities for arts graduates. 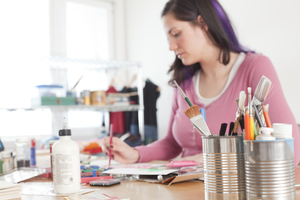 So does taking an entrepreneurial approach – 16 to 20 percent of arts grads start their own businesses. • Diversify your skills. Playing more than one instrument or working across more than one medium will diversify your network and may open up more opportunities. • Join local organizations. Your local arts commission can help you learn about arts housing and available services in your city. You can also make valuable connections by joining the young emerging leader chapter of your local chamber of commerce or downtown leadership group. • Carefully weigh internship opportunities. Alex Frenette, a postdoctoral scholar at Arizona State University, has extensively researched internships in the creative industry. Before taking an internship, he recommends doing your research to determine whether it will be a valuable experience. Ask the organization if their vision of what an intern is matches yours. Find out what types of tasks and projects you’ll be doing. Learn how many interns you’ll be working with and how many employees you’ll be working with. And be wary of unpaid internships.